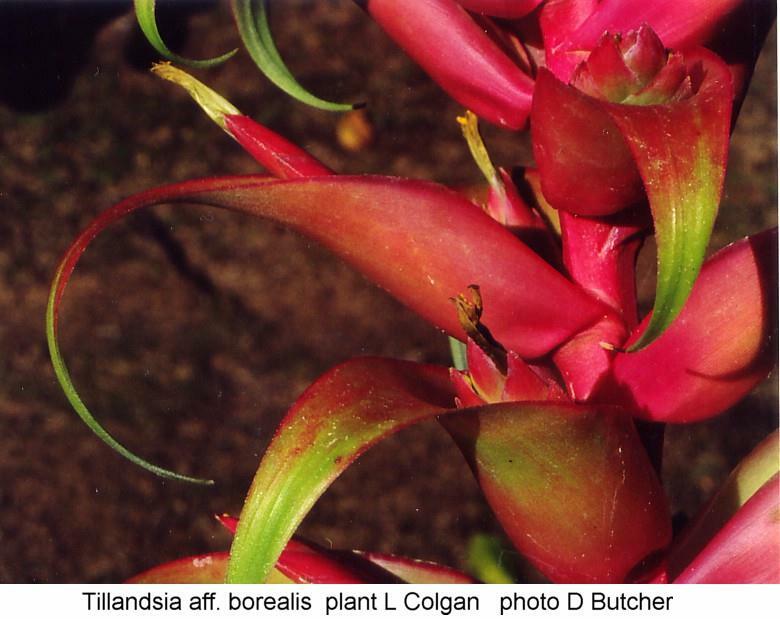 "If you have this plant the chances are that it is T. borealis. The true T. macrochlamys apparently has a pendant inflorescence and violet petals! 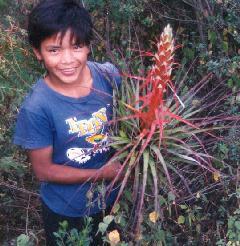 There is a 'macrochlamys' that Renate Ehlers collected in Oaxaca that is being investigated. In the meantime check out your T. macrochlamys!" aff. borealis L.Colgan/D.Butcher. H.Luther. T. macrochlamys, H.Luther. rosette, the rosette obconic, 35 to 45 cm diam. Sheaths light brown, discoloured compared to blade, opaque, elliptic, 12 to 16 cm long, 8 to 9 cm wide, dense punctulate lepidote on both surfaces. 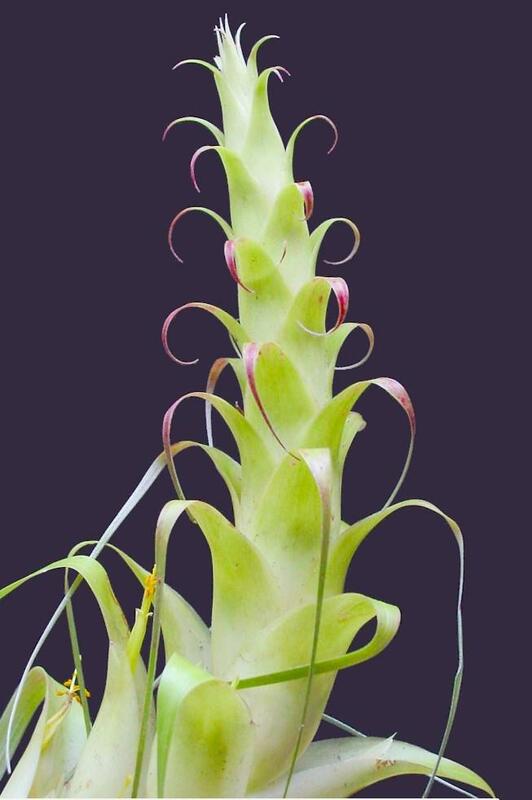 Blade green, narrow triangular-lanceolate, erect at the base, recurved at the apex, 35 to 55 cm long, 2 to 3 cm wide at the base, attenuate, entire, filiform toward the apex, densely punctulate lepidote on both surfaces, velvet to the touch. 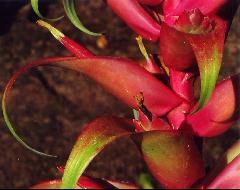 Scape robust, 10 to 20 cm long, 5 to 6 mm diam, inconspicuous but shorter than the leaves, erect. 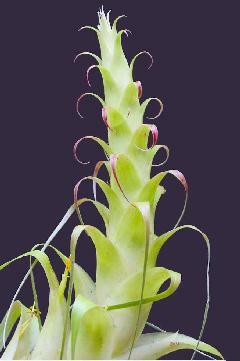 Scape bracts foliaceous, imbricate and totally covering, diminishing in size toward the distal part, 20 to 35 cm long. Rhachis conspicuously ribbed when dry. Primary bracts green to rose, ovate-triangular to ovate-lanceolate, 4.5 to 35 cm long, 1.5 to 3.5 cm wide, the lower ones foliaceous, the blade broad triangular, attenuate, the upper ones bracteose, broad attenuate to acuminate at the apex. Spikes elliptic to ovate-elliptic, 4 to 6 cm long, 1.8 to 2.3 cm wide, strongly flattened, with 4 to 6 flowers, pedunculate, the peduncles short, robust, ebracteate, 1 to 1.6 cm long. Floral bracts green to whitish with a rose apex, triangular to triangular ovate, 2 to 3.5cm long, 0.8 to 1.8 cm wide when flattened, strongly carinate to bicarinate, nerved to smooth when dry, acute to acuminate, glabrous to slightly lepidote at apex. Sepals green to green whitish, free, narrow elliptic to lanceolate, 2 to 2.7 cm long, 5 to 9 mm wide, glabrous, entire, acute to acuminate at the apex, the posterior pair carinate. 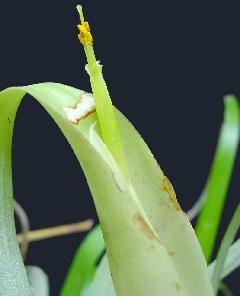 Petals oblong-spatulate, 5 to 5.9 cm long, 6 to 8 mm wide, reflexed at the apex, pale green in the apical half, white in the basal half. Stamens exserted, unequal, filaments linear, flat in the apical portion, 5.3 to 6.5 cm long, white at the base, pale green at the apex. Anthers yellow, basifixed to subbasifixed, oblong, ca. 3 mm long. Ovary ovoid, 6 to 9 mm long, 2 to 4 mm diameter, green. Style exserted, linear, green-whitish, 5.4 to 6.4 cm long. Stigma white to green, conduplicate-spiral (type II sensu Brown and Gilmartin, 1984). 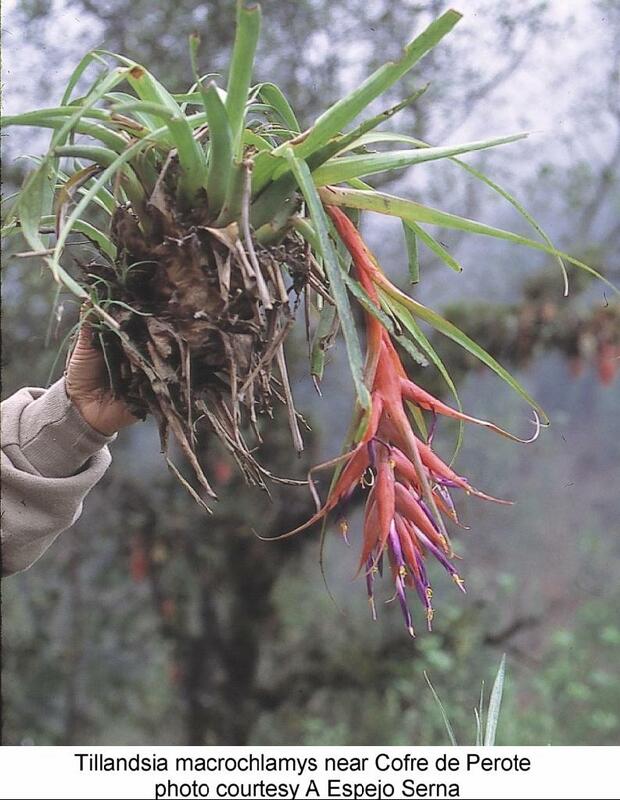 Tillandsia borealis is known up to now only from the states of Durango and Sinaloa ( fig 3), in the municipalities of Pueblo Nuevo and Concordia respectively, where it grows as an epiphyte on Pinus and/or Quercus in pine-oak forests between 1,700 and 2,000 m s.n.m. It flowers from July to August. 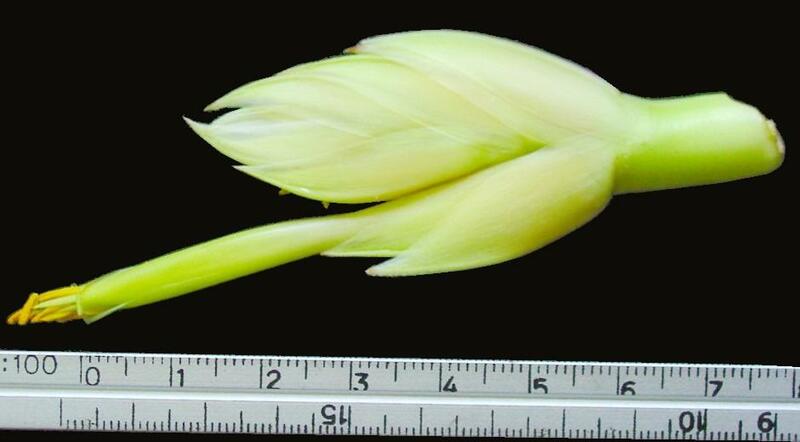 Part of the herbarium material linked to this new taxon here proposed, was initially identified as Tillandsia prodigiosa Baker (fig lc, 3), due to the green colour of the petals and the long inflorescences. Later on, some specimens were identified as T. macrochlamys Baker (fig lb, 3), may be by the presence of the ample primary bracts that cover the short spikes that are on a robust peduncle. However, we think that the species similar to T. borealis is in fact T. carlos-hankii Matuda (fig 3), an endemic taxon of the state of Oaxaca. In chart 1 some of the characteristic of the taxa afore mentioned, which shows how to distinguish them clearly. 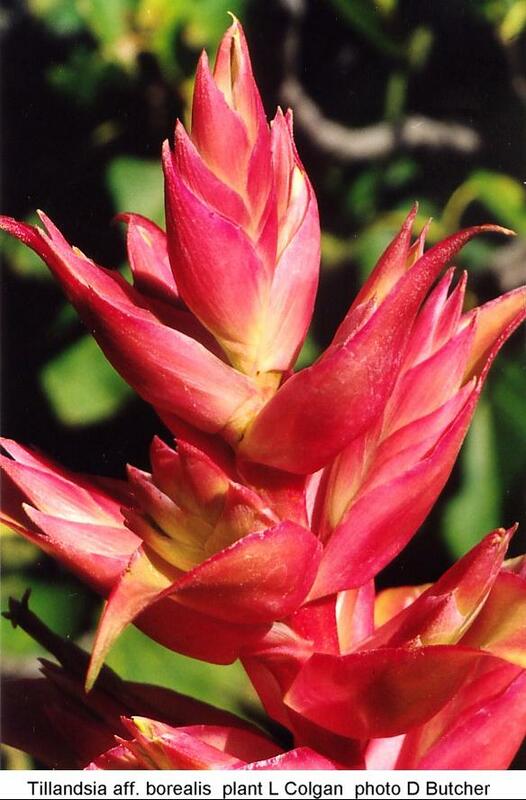 The characters that allow recognition of the species here proposed are: the erect inflorescences, the elliptic to elliptic ovate spikes, provided with a short, robust and ebracteate peduncle and the green petals. The epithet makes reference to the northern distribution of the species in Mexico. 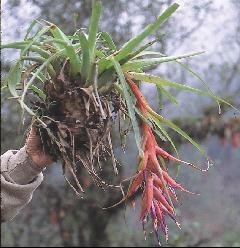 Tillandsia borealis is in the subgenus Tillandsia of the classification proposed by Mez (1896) and continued by Smith and Downs (1977) in their monograph of the family. Also, it belongs to the subgroup 3 of group 1 proposed by Gardner (1986) in her work on the preliminary classification of the genus Tillandsia. It is necessary to point out, however, recent relative publications to the taxonomy of the subfamily Tillandsioideae (Spencer, 1993; Grant, 1995a, 1995b; Terry et al., 1997; Espejo-Serna, 2002; Barfuss et al., 2004, 2005; Till and Barfuss, 2006), where they have emphasised that this classification is artificial and they have suggested the necessity to carry out a careful revision of the generic and infrageneric delimitation in the subfamily.